Image credit: M. Ehlers, pexels.com. It has become a tradition for my fiancé and me to take a walk looking at the Christmas lights when we are at his family’s home in Derbyshire, England. This year it struck me that instead of Santas, angels, bells and stars, we saw a lot of lights showing scenes derived from nature. There were glowing plastic deer and trees in almost every garden. Many had invested in projectors. This latest Christmas light fashion projects moving pictures of falling snowflakes onto your house, giving the impression of real snow falling. Other gardens had huge, inflatable polar bears and penguins. I found these Christmas light choices interesting, because they seemed like an unconscious try to reconnect with nature. Right now, our Western societies are getting increasingly disconnected from nature. This means we spend less time outdoors, interact less with animals as well as plants and feel less like being part of nature. Although, it is difficult to put numbers on our connectedness to nature, the RSPB (Royal Society for the Protection of Birds) published a study in 2013 after interviewing children aged eight to twelve. The young participants had to agree or disagree with 16 statements such as “being outdoors makes me happy” and “humans are part of the natural world”. The report showed that four in five children in the UK are disconnected from nature. This means children spend less time playing outdoors and interacting with nature. Consequently, today’s youngsters feel less empathy for animals and plants, less responsibility for the environment and less like being part of nature. I assume you can already guess where this is going? Exactly, disconnecting from nature is thought to result in people caring less about the extinction of species, pollution and global warming. To value something and safeguard it, you need to be engaged with it. But if we disconnect from nature, we will not care about its fate any longer. So, disconnecting from nature is obviously bad for nature. But will it affect us humans? The answer is it does seem to affect our health. Research has linked visits to parks and other green spaces in cities to better mental and physical health. Some of the health benefits are obvious. If you spend a lot of your time in parks, you are more physically active. Nevertheless, a lot of research still needs to be done on this subject to find all the links. The main message is: We humans also profit from a good connectedness with nature. Back to our Christmas light story. As a society we are disconnecting from nature. Still people choose a lot of nature scenery for their Christmas lights which shows that people still value nature in a way. The Christmas lights I saw felt like they romanticised animals and plants like a memory from better days a long time ago. This is where I want to remind people, that nature is still here. Yes, we are losing many species and ecosystems, but all is not lost yet! Deer still roam across a great number forests and meadows in the Northern hemisphere and the last time I checked we still had trees too. If we decide to protect and safeguard our local ecosystems, there is no need to buy plastic copies of its animals and plants. We could experience real animals and plants for free. The RSPB has a few tips for those wanting to protect their local wildlife and ecosystems. If we decide to effectively fight climate change with real, lasting changes to our lifestyles and economies, there is no need to project falling snowflakes onto our houses. We could have real snowfall for free. The campaign Sustainability for All has some very good suggestions on how to fight climate change with simple lifestyle choices. So, what can you do to reconnect and stay connected to nature? Indoors, buy and grow plants in your house, apartment, balcony or garden. Watch nature documentaries. Read books about animals and plants. Feed birds in your garden or on your balcony. Outdoors, go to the local park for a walk or a run, look for plants and animals you don’t know and google them or look them up elsewhere. Take your kids, encourage them to play in the mud and look for plants as well as insects. Go to the zoo. Go to the country side for a walk, a run or a bike ride. Go to the local beach or lake for a swim in the summer instead of the indoor swimming pool. There are countless possibilities. Find the ones you enjoy most. But whatever you do, do not get glowing plastic deer and trees for your garden! Active reading exercise: How do muscles work? Image: D. Keeno, 17 November 2017. Muscles work by getting shorter. We say that they contract. Muscles are attached to bones by strong tendons. When a muscle contracts, it pulls on the bone, and the bone can move if it is part of a joint. Muscles can only pull, but not push. This would be a problem if a joint was controlled by just one muscle. As soon as the muscle had contracted and pulled on a bone, that would be it, with no way to move the bone back again. The problem is solved by having muscles in pairs, called antagonistic pairs. To move the bone back the second muscle of the antagonistic pair contracts. Examples of antagonistic pairs are biceps and triceps. How does your forearm move? The elbow joint lets our forearm move up or down. It is controlled by two muscles, the biceps on the front of the upper arm, and the triceps on the back of the upper arm. The biceps and the triceps are an antagonistic pair. When the biceps muscle contracts, the forearm moves up. When the triceps muscle contracts, the forearm moves down. This solves the problem. To lift the forearm, the biceps contracts and the triceps relaxes. To lower the forearm again, the triceps contracts and the biceps relaxes. 1. Box how muscles work. 2. Circle what attaches muscles to bones. 3. Underline what happens when muscles contract. 4. Underline why muscles need to work in antagonistic pairs. 5. Describe in your own words how antagonistic pairs work. 6. Explain in your own words how your forearm moves. The following text is written for pupils with low reading ages to help them study the topic of antibiotics and bacteria resistance. Think back to the last time you cut yourself. Can you imagine that cut becoming infected with bacteria – so seriously infected that you would die? Before the discovery of antibiotics, there was nothing anybody could do. Bacteria could kill 80 percent of people with infected wounds. Who would have thought a mouldy plate would lead to this? In 1928, Alexander Fleming, a doctor at London’s St. Mary’s Hospital, found that a mould on a discarded plate had antibacterial properties. This mould was ‘penicillin’. Penicillin is an antibiotic. Antibiotics kill bacteria and slow down their growth. A bacterium consists of one single cell and antibiotics disturb their cell functions. Antibiotics do not work against viruses because a virus consists of a DNA fragment instead of a cell. Human life expectancy increased rapidly by eight years when antibiotics were first introduced in the 1930s. Within four years of penicillin being introduced onto the market, bacteria resistance was being reported. Bacteria resistance means that an antibiotic no longer kills the bacteria. Today bacteria resistance against commonly used antibiotics is increasing rapidly around the world and a growing problem. The following active reading exercise includes a short test and tasks suitable for students aged 11 to 14 when studying waves and sound. When waves hit a surface, they are reflected. This means they bounce off the surface and come back. For example, light is reflected by the surface of a mirror. When you are high up in the mountains and call out in a loud voice. Your sound waves will be reflected by a mountain surface nearby and you can hear it coming back after a few seconds. This is called an echo. You can measure the distance from where you stand to the mountain surface and time how long it takes until your hear the echo. With this information you can calculate the speed of sound. This principle is used by animals like dolphins and bats for navigation. They send out sound waves and listen for their echo. This helps them to work out how far away predators or food are. When used like this echoes are called sonar. Sonar is also used by submarines for navigation. Submarines send our sound waves and listen for the echo to know their own position. They can also detect other submarines and ships. Box the words in the text you do not know. Highlight what happens to waves when they hit a surface. Highlight the word that describes the reflection of sound waves. Circle the two types of waves that are mentioned in the text. a) Underline the animals that use sonar. b) Underline how submarines use sonar. *Extension: Explain what a dolphin needs to know to work out the distance to a fish when using sonar. Title image credit: Maurice Snook, ACS (2011). Why not try some Christmas chemistry with your science and chemistry students during the last week before Christmas? The easy-to-do Christmas experiments in this article can be used to shake things up a little just before you break up for turkey roast and minced pie. With the instructions come suggestions about what previous knowledge can be discussed together with these experiments. This experiment is very easy and can be done by the students or as a demonstration. It is suitable for ages 11 to 16. It can even be done with or demonstrated to primary children if you trust them with candles. This short practical or demonstration can be used to discuss the flammability of different organic substances. The oil burning in the flames is a fat, which can be used to recap carbon chemistry. The combustion of the oil can be linked to oxidation reactions and exothermic/endothermic reactions. This experiment is suitable for ages 11 to 18. It is adapted from a procedure by A.M. Helmenstine (2017). The poinsettia flower originates form warmer climates. Nevertheless, many people use them as a decoration in their house during the winter holidays. Their red leaves contain substances that change colour when they are in contact with an acid or a base. For this reason, poinsettias are one of the natural pH indicators such as turmeric and red cabbage. You will need a poinsettia flower, a beaker, water, scissors, filter paper, a bunsen burner or a heating plate, a tripod, a funnel, a pH meter or universal indicator paper, 0.1 M HCl (hydrochloric acid), vinegar (dilute acetic acid), baking soda solution (10 g/ 1 dm3) 0.1 M NaOH (sodium hydroxide) and any other acids or bases you would like your pupils to test. With scissors cut a few petals of a poinsettia plant into very small pieces and put them into a beaker. Add just enough water to cover the petal pieces and boil with Bunsen flame or heating plate for a few minutes until the water has taken the colour of the petals. Then, filter the liquid with a funnel and filter paper into a conical flask. This solution can already be used as a pH indicator solution. To make pH paper, some of the solution needs to be poured onto a petri dish. Afterwards, pH paper is placed onto the petri dish to soak in the indicator solution. The filter paper has to dry and can finally be cut into pH strips. The pH paper and indicator solution can be tested against different acids and bases, such as 0.1 M HCl (hydrochloric acid), vinegar (dilute acetic acid), baking soda solution (10 g/ 1 dm3) and 0.1 M NaOH (sodium hydroxide). The exact colour range for pH values can vary for different poinsettia plants. Students can be challenged to make their own poinsettia pH chart. For this, they will have to measure the pH of the test solutions above with a pH meter or universal indicator paper which already has a colour chart. They can then match their poinsettia indicator colour to the pH meter or universal indicator chart. Obviously, you can link this practical to indicators and natural indicators as well as everything the pupils already know about acids and bases. This experiment is suitable for ages 14 to 18. A-level and more able KS4 students could even be challenged to plan their own investigation and experiment to answer the question. The question is: What happens to sodium bicarbonate when it is heated in the oven during the baking process? ped inside the dough during the baking process. This is important since the gas raises the cake and provides the “fluffiness” in cakes and cookies. This experiment can be adapted and shortened by omitting the calculations and deciding which reaction equation is right. This would still demonstrate that sodium bicarbonate loses mass when heated during baking as it releases water and carbon dioxide. 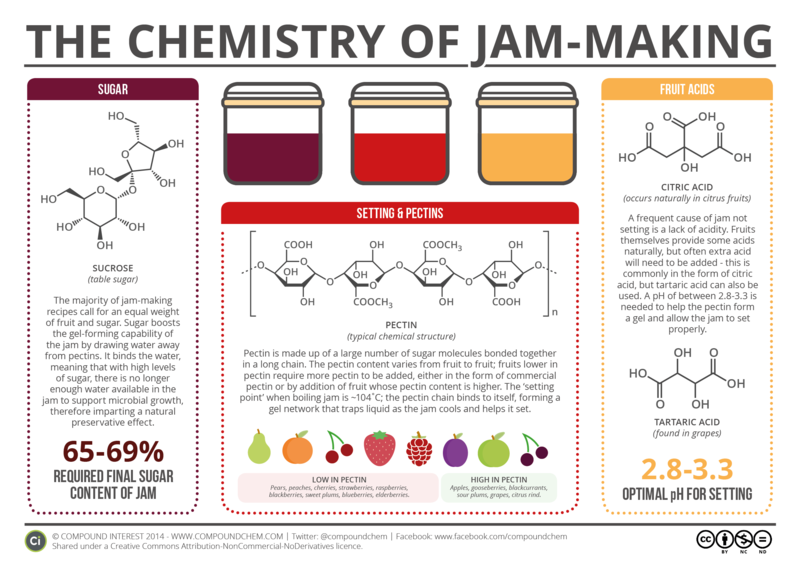 The importance of this for baking can still be discussed and stressed with students. For the experiment, pupils need to weigh in and write down an exact amount of sodium bicarbonate. 2 to 3 g are suitable. The scales should be as exact as possible for this task. The sodium bicarbonate is put into a crucible. NOTE: It is important that the students write down the weight of the empty crucible as they will have to weigh the thermal decomposition product inside the crucible. They should also mark their crucible with their name. The crucible should be heated for 15 to 20 minutes at 180 degrees Celsius. This can be done in any oven. (Maybe your food department can help you out, if you do not have any oven and the crucibles have been thoroughly cleaned before the experiment.) It is also possible to heat the crucible over a bunsen flame for about 20 minutes. After heating the sample, students need to weight it again and write down the new mass. This part can be omitted. If you do, you should provide your pupils with the information about chemical reaction directly and discuss the importance of it for baking. Their task now is to figure out which reaction is taking place during the thermal decomposition of sodium bicarbonate. They need to be given the information that the gasses formed are carbon dioxide (CO2) and water (H2O). The mass of sodium bicarbonate before the experiment is sodium bicarbonate NaHCO3, let us assume it was 2.0 g. This means we had 0.024 mol of sodium bicarbonate in the beginning (n = 2/84). For two mole of sodium bicarbonate, one mole of sodium carbonate, Na2CO3, is formed. This means we have 0.012 mol sodium carbonate which equals 1.272 g (m = 0.012 x 106). Does this mass, 1.272 g, match the mass that we have after the experiment? You can do the calculation also for sodium hydroxide (NaOH; M = 40 g/mol) and sodium oxide (Na2O; M = 62 g/mol) to show that it must be sodium carbonate which is formed. The calculated masses for sodium hydroxide and sodium oxide will not match the mass from the experiment after heating! For sodium hydroxide, we would have a mass of 0.48 g (m = 0.012 x 40) and for sodium oxide 1.488 g (m = 0.024 x 62), if 2.0 g (= 0.024 mol) sodium bicarbonate are weighed in before the experiment. This experiment can be used to discuss thermal decompositions and endothermic reactions. As seen with the calculations, conversions between mas and amount of substance can be practiced and revised. In addition, the conversion of mass can be discussed. My experience is that pupils really like the link to everyday life which is baking, especially during Christmas time. This aspect should really be stressed when doing this experiment. When teaching this experiment earlier, I provided my students with gingerbread recipes when they left after the session. The students really appreciated this little give-away and I can recommend if you want to do this experiment. This experiment is most for A-level students if they are to conduct it themselves. For younger ages, it is better as a demonstration. It is essentially Tollen’s test and demonstrates how reducing sugars reduce silver ions to silver. The method is adapted from the Royal Society of Chemistry and the Nuffield Foundation (2015). You will need bottles that should be as small as possible. (Small booze bottles are useful.) These bottles need to be cleaned thoroughly and rinsed with purified water before the experiment. Further, 25 cm3 beakers, funnels, pipettes, silver nitrate (AgNO3, s), potassium hydroxide (KOH, s), glucose (dextrose) (= reducing sugar), ammonia solution, (NH3, aq) and concentrated nitric(V) acid, (HNO3, aq) and purified water are needed. The following solutions need to be prepared, but NOT mixed before the experiment. The solutions should suffice for about 10 experiments. dissolve 2.2 g of glucose in 50 cm3 of purified water. The following instructions are for a 50-cm3-bottle, the amounts will have to be adjusted for larger or smaller bottles. Place 15 cm3 of the silver nitrate solution in a 25-cm3-beaker. In a fume hood, add a few drops of ammonia until the brown precipitate dissolves. The colourless complex ion, [Ag(NH3)2]+ is formed. Now, pour 7.5 cm3 of the potassium hydroxide solution into the 25-cm3- beaker and a dark brown precipitate of silver(I) oxide (Ag2O) is formed. Then, add a few more drops ammonia solution till the precipitate dissolves again. The formed clear solution is called Tollen’s reagent. Pour this solution into your small bottle using a funnel and add 1 ml of the glucose solution with a pipette. Screw the cap on the flask and swirl the solution so that the whole of the inner surface of the flask is wetted. The solution will turn brown. Continue swirling until a silver mirror forms after 2 minutes. After the experiment, wash the solution down the sink with plenty of water. Rinse out the flask well with water. A string can be added around the neck of the flask, so it can be hung up in a Christmas tree at home. Obviously, this experiment can be used to link to learning about reducing sugars, but also to redox reactions. It can even be used to discuss noble metals and why silver is easily reduced considering the electrochemical series. Silver Christmas Decorations with Tollen’s Reagent: Royal Society of Chemistry and the Nuffield Foundation (2015), Learn Chemistry, http://www.rsc.org/learn-chemistry/resource/res00000822/a-giant-silver-mirror-experiment?cmpid=CMP00004158 (25 November 2017). Image: An ionic liquid tested for the application in lithium-ion batteries at Chalmers University of Technology Gothenburg and Uppsala University (Sweden). Ionic liquids are basically salts with low melting points of under 100 degrees Celsius. Some might pause now because in school we are normally taught that salts have very high melting points. This is true for most – let us say – ”common” salts as for example table salt with the scientific name sodium chloride (NaCl). Sodium chloride has a melting point of 801 degrees Celsius which I guess can be considered a high melting point. Salts consist of positive and negative ions that attract each other electrostatically which results in the formation of ionic bonds. This is how they form the compounds that we know as salts. Sodium chloride contains positive sodium ions and negative chloride ions. The strong attraction between the positive and negative charges causes the high melting points we observe in most salts. Nevertheless, salts with low melting points and ionic liquids do exist. Why is that? The melting points of a salt are generally lower, the larger the ions are that it is made up from. For example, when changing the positive ion ( also called cation) in sodium chloride from sodium to the bigger rubidium ion, the salt rubidium chloride is obtained which has a melting point of 715 degrees Celsius. The melting point of rubidium chloride is 86 degrees Celsius lower than that of sodium chloride because the rubidium ion is bigger. When choosing even larger postive ions, for example the organic cation 1-ethyl-3-methyl-immidazolium, a salt called 1-ethyl-3-methyl-immidazolium chloride (a real tongue breaker) is obtained which has a melting point of only 89 degrees Celsius. This salt is an ionic liquid which melts under 100 degrees Celsius. We arrived at this ionic liquid simply by exchanging the positive ion (cation) with larger ones. Also, the negative ions (also called anions) – the chloride ion in our case – can be exchanged with larger ones. When switching from the chloride ion to the organic anion bis(trifluoro methane sulfonyl) imide (another tongue breaker), the melting point can be lowered even more. When putting together the anion bis(trifluoro methane sulfonyl) imide with the cation 1-ethyl-3-methyl-immidazolium a salt with a melting point of -15 degrees Celsius is obtained. This salt (I will spare you the name) is a room temperature ionic liquid (RTIL). This is indeed a salt which is liquid at room temperature. So, why do chemists make liquid salts? I admit a salt that melts at a lower temperature than water is pretty cool, but are they good for anything? To answer this question, we have to first look at the properties. The most important properties of ionic liquids are that they can conduct electricity due to their mobile ions and that they are stable even at high temperature which also means that they are non-flammable and cannot easily catch fire. Especially, their good high-temperature staibility makes ionic liquids interesting for many applications, for example as high-temperature lubricants in machines or as solvents for chemical reactions in the industry. Due to the conduction of electricity, ionic liquids are also tested in solar cells and batteries. I have talked to Manfred Kerner, a PhD student in the Applied Physics Group at Chalmers University of Technology in Gothenburg (Sweden) who is working on the application of ionic liquids in batteries. Kerner is trying to use ionic liquids as the electrolyte (= the liquid placed between two battery electrodes) in lithium-ion batteries. One big problem lithium-ion batteries face is the high flammability of commonly used electrolytes which is a part of the reason for many youtoube videos showing laptops on fire. Ionic liquids can be a solution to this problem because they are stable at high temperatures and do not catch fire, while they are able to conduct electricity. These properties are especially useful for high-temperature lithium-ion batteries which run at temperatures higher than room temperature and are popular in hybrid electric vehicles. Nevertheless, Kerner admits that there are still some hurdles to overcome until ionic liquids can be broadly applied in batteries. One example is their high cost. Another is that ionic liquids strongly attract water from air which damages the electrode materials of lithium-ion batteries. For this reason the use of controlled water-free environments such as gloveboxes is necessary. In addition, ionic liquids are not stable in contact with all the possible battery electrode materials which limits their use. Despite these drawbacks some ionic liquids are already on the market as electrolytes for batteries according to Kerner. However, they are so far mainly limited to research applications. Nevertheless, some day in the future we might find ionic liquids in our own laptop or car batteries.